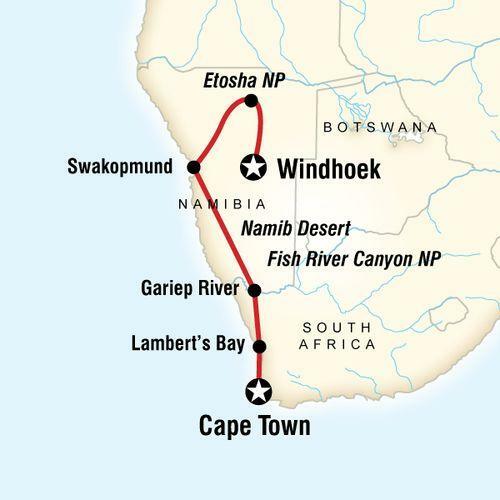 From the cosmopolitan streets of Cape Town to the desert and lunar scenery of Namibia, witness the diversity of southwestern Africa on this 12-day nature adventure. Leave footprints on some of the world's highest sand dunes, peer deep into the heart of Africa’s largest canyon, and experience incredible wildlife drives through Etosha National Park. Your knowledgeable Chief Experience Officer will take care of the planning while you recharge in a combination of hotels, camping, and guesthouses for a cultural experience you’ll treasure forever. Have your breath taken away by incredible scenery and marvel at amazing wildlife - this is truly an African experience! Take a day trip into the wine lands of South Africa with an expert guide. Visit iconic estates and lesser-visited farms only known to locals, in areas such as Stellenbosch and Paarl. Indulge in tastings and pairings with cheeses, chocolate, and local delicacies such as Biltong (salted meat). Walk through vineyards and cellars for an all encompassing look at wine production, and learn about the history of this region. Gesondheid! Travelling from Cape Town to Lambert's Bay, with a stop along the way at !Khwa ttu San Culture and Education Centre. The San people of Southern Africa have historically faced centuries of political and cultural oppression. The !Khwa ttu San Culture and Education Centre provides tailor-made training for young San women and men of Southern Africa. Travellers learn about San culture and history at the interpretive museum. Visits help trainees gain experience with international clients while garnering support for the centre's efforts to preserve San culture and history. Visit Fish River Canyon, the largest canyon in Africa and, arguably, the second largest in the world. We will only have access to the rim, but the views are spectacular. Head out and start exploring this unusual environment. This area is famous for its high, red sand dunes. This clay and salt pan is surrounded by the dunes, making it a spectacularly beautiful sight with a remote and isolated feel. There's plenty to see and do in Swakopmund, and we wanted to make sure that you had some time to take it all in. Feel free to relax or try optional activities like quad biking, sandboarding, and skydiving. Your CEO has more ideas if you need them. Just ask! Set off into the wilds of Etosha National Park in the touring vehicle for a wildlife safari drive. Over 100 species of mammals call Etosha home, including elephants, giraffes, lions, rhinos, and hyenas. Penduka works with women from the Katutura township, and surrounding rural communities, by helping them develop livelihoods through working in their handicraft workshops and cafe. Penduka trains and employs women disadvantaged through poverty, disability, ill-health, or lack of education, empowering them to develop skills in textiles, beading and pottery. Pick up a fresh-packed lunch at the cafe to help support the centre before touring the facilities and purchasing some of these crafts. G Adventures for Good: !Khwa ttu San Culture and Education Centre, Swartwater. G Adventures for Good: Penduka Village Restaurant & Shop, Windhoek. Fish River Canyon entrance. Sossusvlei Dunes and Sesriem Canyon entrance. Etosha National Park entrance with wildlife safari drives. All transport between destinations and to/from included activities. Marvel at the Fish River Canyon, climb Dune 45, get your adrenaline going with adventure activities in Swakopmund, spot wildlife in beautiful Etosha National Park. Participation Camping (please bring your sleeping bag and towel). 2) Shuttle: if you wish to take a shuttle to the city centre, when arriving at the international terminal, turn immediately left and walk straight ahead and you'll see the shuttle services desk. Cost is approximately 80ZAR. African Union / Unity Laissez Passes, Andorra, Argentina, Australia, Austria, Belgium, Botswana, Brazil, Canada, Chile, Czech Republic, Denmark, Ecuador, Finland, Japan, Liechtenstein, Luxemburg, Malta, Monaco, Netherlands, New Zealand, Norway, Paraguay, Portugal, San Marino, Singapore, Spain, St Vincent & the Grenadines, Sweden, Switzerland, United Kingdom, Uruguay, Venezuela, United States of America, France, Germany, Greece, Iceland, Israel, Italy, Jamaica. GENERAL: Look after your personal items. Do not leave your valuables visible in a car or hotel room. Lock your hotel room door when you enter and when you leave. Do not carry large amount of cash on you. Avoid displaying flashy jewellery and carry your camera in its pack on your shoulder rather than around your neck. Keep your passport, airline tickets, money, important documents locked up in your room/safe - do not carry it with you. NAMIBIA: Always be alert of animals that are wandering too close to the road. Both domestic and wild animals frighten easily and can jump directly in front of the moving vehicle. If possible, avoid travelling at night. Some wildlife tends to be more active at dusk. Always be on the look-out for sandy patches, potholes and sharp bends in the road. In rainy or wet conditions beware of slippery roads, washaways, running and or stagnant water. Always have enough water (bottled) for the journey. NO matter how beautiful or gentle an animal may appear, the only safe way to look at it is from the safety of your vehicle. Eating is a big part of travelling. Travelling with G Adventures you experience the vast array of wonderful food that is available in southern Africa. On this tour, we provide only a few meals for you and your group members, so as to give you the maximum flexibility in deciding where, what and with whom to eat. It also gives you more budgeting flexibility in you choices. Our groups tend to eat together to enable you to taste a larger variety of dishes and enjoy each other's company. There is no obligation to do this though - while in the larger centres, your CEO will be able to suggest favourite restaurants during your trip.